Three separate expeditions head for the jungles of Guatemala in search of the Green Goddess, a primeval Mayan idol that contains a fortune in jewels and an ancient formula for an immensely powerful explosive. Major Martling (Frank Baker), the leader of one of the expeditions, is only interested in the Goddess for its archeological value–but the leader of one of the others, the ruthless adventurer Raglan (Ashton Dearholt), is out to acquire the explosive formula at any cost. The third expedition is led by Ula Vale (Ula Holt), whose fiancé David Brent died in an earlier search for the Goddess; she hopes to protect the world from the deadly menace of the formula by keeping it out of Raglan’s hands. The paths of all three Goddess-seekers cross with those of Lord Greystroke (Herman Brix), best-known to the world as Tarzan; he’s journeyed to Guatemala in search of his explorer friend Paul D’Arnot, who was captured by a lost tribe of Mayans during the same expedition that claimed the life of Brent. Tarzan quickly joins forces with Martling, and soon allies with Ula as well; together, they’re drawn into a desperate battle with Raglan and with the sinister lost tribe–a battle in which Tarzan’s extraordinary strength, speed, and stamina (the fruit of his jungle upbringing among the great apes) prove extremely handy. Above: The coveted Green Goddess. The New Adventures of Tarzan was turned out by Burroughs-Tarzan Enterprises, a company brought into being by actor and independent producer Ashton Dearholt–who had served as production manager on the serial Young Eagles, and had also journeyed to Guatemala to shoot portions of the pseudo-documentary Adventure Girl (released through RKO). 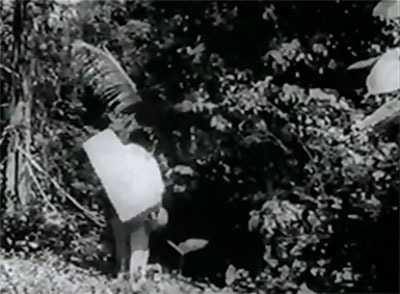 This previous experience with serial-making and with Guatemala undoubtedly helped Dearholt convince his personal friend Edgar Rice Burroughs to provide a plot outline and monetary backing (along with the prestige of his name) for Dearholt’s production of a Guatemala-filmed chapterplay based on Burroughs’ famous character Tarzan; Burroughs’ dissatisfaction with MGM’s successful but heavily altered screen treatments of his Tarzan books also played a part in his decision to underwrite Dearholt’s venture. Said venture ended pretty disastrously; adverse weather and inhospitable terrain turned the Guatemala shoot into a time-consuming and expensive nightmare, while limited theatrical rentals in the United States kept the serial from turning much of a profit. These limited rentals were partly due to MGM; that studio, hoping to discourage theaters from offering a competing Tarzan product, threatened to withhold its own very popular films from exhibitors who ran the serial. New Adventures‘ production woes led to an almost complete script rewrite (as evidenced by extant pressbooks), but the serial’s plot is still easy enough to follow and contains no noticeable loose ends–save for the mysterious and unexplained hand that unlocks the cabin door in Chapter Eleven and for the final episode’s title (which references a discarded subplot). However, though coherent, the plot is more than a little thin; like most independent serials, New Adventures was designed to be easily editable into feature format–and Dearholt and his writers (Charles Royal, Bennett Cohen, Basil Dickey, and Edwin Blum) chose to cram nearly all of the feature-film material into an unprecedentedly lengthy first episode, instead of spreading it out over multiple twenty-minute chapters (as Sol Lesser’s production crew did in Return of Chandu). 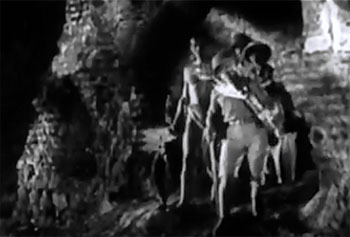 Thus, the heroes reach the Mayans’ lost city, find D’Arnot, and locate the Green Goddess during the course of this hour-long opening chapter, after a danger-filled journey that could have (and should have) been used to fill about three episodes; with so many goals achieved before the end of Chapter One, the writers are forced to have their characters spend too many of the ensuing chapters simply pursuing each other in circles through the jungle, with Tarzan and his friends trying to recover the stolen Goddess from Raglan and Raglan trying to steal Major Martling’s notebook (which contains a parchment that outlines the only safe method of opening the potentially explosive idol). Above: Raglan lugs the precious Goddess into the depths of the jungle. Judging from the pressbook synopsis, the original script had Raglan posing as a good guy and Ula pretending to be a crook for much of the running time, and also gave prominent roles to a couple of shady temporary associates of Ula’s and to Guatemalan government agents who wrongfully suspected Martling’s daughter Alice and her fiancé Gordon of being spies. These additional complications would have made the duel over the Goddess seem a lot less repetitious, although the writers do come up with some new plotting variations that save the narrative as it stands from becoming completely circular. A temporary return to civilized territory in Chapter Four and a permanent return to civilization in Chapter Ten (which leads into a climactic sequence aboard a ship) provide well-timed relief from the jungle-bound dueling; the entrance (in Chapter Seven) of a Mayan vengeance squad bent on recovering the Goddess also adds a welcome new wrinkle to the storyline, and leads to an exciting second visit to the Mayans’ lost city. This latter subplot is not mentioned in the pressbooks, and rather abruptly introduces a couple of characters (the high priest, the expatriate scientist) not seen during the earlier lost-city sojourn–which would seem to indicate the writers quickly (but wisely) concocted it when production setbacks necessitated the jettisoning of the other subplots. 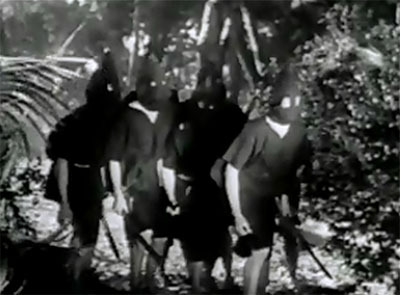 Above: The eerie-looking masked squad of vengeful Mayans. New Adventures’ repetitive plotting is frequently accentuated by pace-slowing padding (another hallmark of most independent serials); redundant footage lends a rather dragged-out feeling to many scenes that would have worked better with tighter editing–among them the one in which Raglan painstakingly sets up a booby-trap, the sequence in which Tarzan escapes Raglan’s henchmen by vigorously straining at (and eventually snapping) a rope, the various scenes that have characters shadowing each other through the jungle, and the sequence in which Ula searches the ruinous Mayan city while the natives lurk around her. 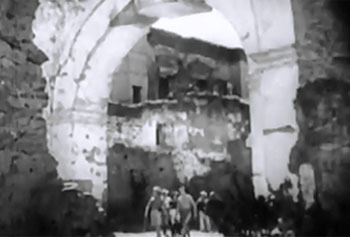 However, the latter scene–and the other sequences set in the crumbling city–are at least memorably atmospheric, thanks to New Adventures’ location shooting; the serial’s heavy utilization of real-life Spanish and Mayan ruins (particularly the earthquake-ravaged remains of the 16th-century Spanish settlement of Antigua) gives its lost-city segments a genuinely remote and ancient aura unmatched by any other chapterplay. 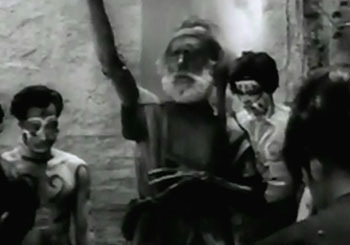 Though director Edward Kull (who also served as cinematographer, assisted by Ernest Smith) was obviously constrained by his budget and shoots much of the serial in a fairly uninspired and often ragged style, he does bring a properly shadowy and eerie look to these Antigua scenes (and adds a few other visual flourishes to the serial on occasion). The town of Chichicastenango and multiple stretches of Guatemalan wilderness are also used for interesting visuals, lending the serial some convincing exoticism–although the much more familiar Lake Sherwood area is used for some of the jungle scenes as well. Sections of Guatemala City are put to use too, as are some obviously genuine dockyards–whether Guatemalan or American, I couldn’t say. Above: The Martling expedition explores the awe-inspiring Antigua ruins both above-ground (top left) and below-ground (top right). 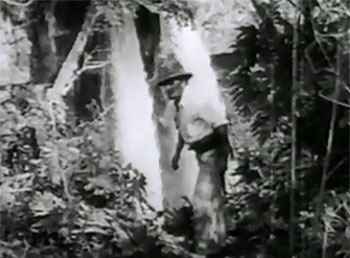 At bottom left, Raglan lurks in front of a Guatemalan jungle waterfall, while at bottom right Tarzan is strikingly silhouetted against a dockyard horizon as he prepares to surprise Raglan and his thugs. 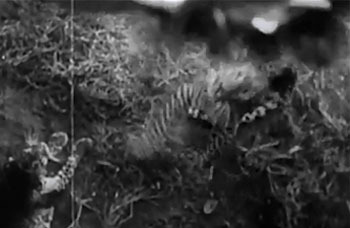 Most of New Adventures’ animal footage, like that in the above-mentioned Young Eagles, is more geographically accurate than in most jungle serials; leopards are shown, but pointedly designated as jaguars, while peccaries, pumas, spider monkeys, and other Central American animals all make appropriate appearances (most of the animal scenes were shot at the Selig Zoo in California). 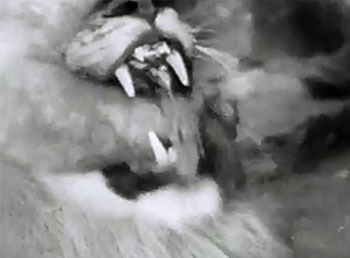 However, this overall accuracy makes the inexplicable appearance of an African lion–which menaces Tarzan in Chapter Nine and fights him in Chapter Ten–more jarring than it otherwise would have been (judging by the pressbook, this lion sequence would seem to be one of the New Adventures scenes shot to replace unfilmed or unusable footage; the pressing need to come up with a new scene presumably made the producers quite happy to overlook the zoological oddity of the big cat’s presence). 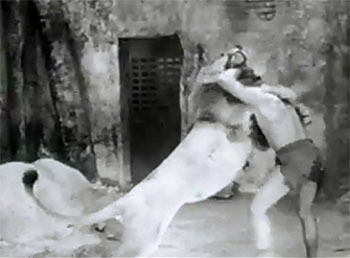 The Chapter Ten lion fight itself, however, is a terrific action scene–performed in lively and ferocious style by Melvin Koontz and his trained lion Jackie, and featuring some frightening closeups of the cat as it seemingly tries to bite the hero’s arm off; Koontz and Jackie also team for a strong fight scene in Chapter One (this latter sequence is actually supposed to be taking place in Africa, unlike the Chapter Ten lion scene). Above: Shots from the fierce Chapter Ten lion fight. Though Koontz doubles Herman Brix in both the lion sequences, Brix does his own stuntwork in the serial’s other action scenes–impressively demonstrating his Olympic-level athletic skills as he swings through trees, dives from heights, or swims rushing rivers; his swing through the ship’s rigging in Chapter One and his spectacular vine-swing and drop into the river in Chapter Four are especially outstanding (the latter sequence is obviously a succession of individual stunts edited together to create a single piece of action, but no less admirable for that). Brix is equally impressive in his many fight scenes–particularly when he’s bodily lifting his opponents and violently tossing them through the air; said opponents deserve credit too, since they also are obviously undoubled by stuntmen. 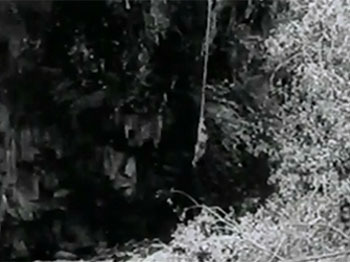 Above: Herman Brix as Tarzan leaps from a tree to a vine (top left), swings through a river gorge on the vine (top right), flips and drops from the vine (bottom left), and plunges into the river (bottom right) as he pursues Raglan in Chapter Four. The fight scenes themselves tend to be rather haphazardly shot and staged–particularly the several sequences in which Tarzan combats huge swarms of hostile natives–although this lack of polish does give a ferocious and realistically rugged appearance to the serial’s many hand-to-hand combats. The wild Chapter Two melee in the lost city–during which Tarzan furiously battles natives with club and fist, jumps from a ruined wall to attack Raglan and his men, and subjects Raglan to one of the aforementioned violent tosses–is one of the serial’s lengthiest and most entertaining action scenes (and was wisely used as the grand finale to the New Adventures of Tarzan feature); other highlights include the hotel-room fight in Chapter Four, the fight in the jungle in Chapter Eight (during which Brix nimbly clambers in and out of trees), the Chapter Ten fight in the dockyard, and the brief but nicely-shot shipboard fight in Chapter Eleven. 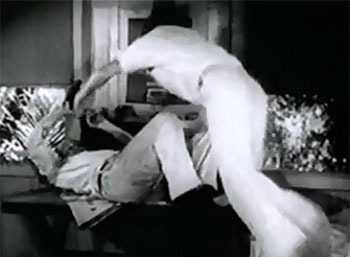 Above left: Herman Brix makes a flying leap onto a henchman during the Chapter Four hotel fight. Above right: Brix prepares to toss a native foe during a clash in the lost city in Chapter Nine. 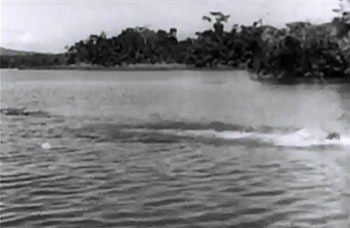 The two lion fights described above are easily the serial’s best animal-related action scenes, although Tarzan’s watery race with a pursuing alligator in Chapter One and the later Chapter One scene in which Alice Martling (Dale Walsh) dangles over a pit of “jaguars” (leopards) are both memorable–and convincing; Herman Brix actually shared the water with the gator in the former sequence (it narrowly misses biting him in the leg, on-camera), while skillful editing and photography makes it seem as if the leopards in the pit scene really are leaping within inches of Walsh. Tarzan’s subsequent fight with the pit leopards is less effective, due to the fact that the cats turn into obvious taxidermists’ specimens when they start wrestling with the hero; the same is true of the Chapter Two fight between Tarzan and a black jaguar and Tarzan’s Chapter Five fight with a puma. However, at least these lesser animal-fight scenes are aided by a furious tempo; Herman Brix grapples so vigorously with the ersatz cats that their battles take on an entertaining degree of energy, while the editors cut the fights rapidly enough to significantly conceal the phoniness of the stuffed animals. Above left: Tarzan swims for shore with a gator close behind. Above right: Dale Walsh’s hair dangles at the top of the frame while one of the “jaguars” at the bottom of the pit leaps frighteningly at her. Though they’re often weakened by insufficient editing (and, sometimes, by cheat resolutions), there are many solid chapter endings in New Adventures–among them Chapter One’s double cliffhanger (Tarzan apparently stabbed by a Mayan priestess as the Martling expedition members are seemingly shoved into an alligator pit), the more mundane but nicely-shot fall from a balcony at the end of Chapter Four, the Chapter Six deadfall cliffhanger, the Chapter Seven plunge over a waterfall, the Chapter Nine cliffhanger in which a chained lion breaks free to attack a helpless Tarzan, and the Chapter Ten cliffhanger in which the camera dramatically zooms in on a gun as Raglan fires the weapon at Tarzan. The tunnel explosion that concludes Chapter Two is good when it finally arrives, but is preceded by a severely overlong buildup segment; Tarzan’s imperilment by a snare at the end of Chapter Three, on the other hand, is given no buildup at all and comes off as far too abrupt–although the hut fire that accompanies it (and turns Chapter Three’s ending into a double cliffhanger) is effectively handled. 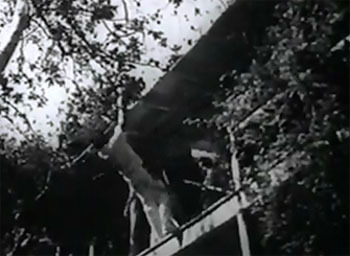 Above left: Tarzan plunges from a balcony at the end of Chapter Four. Above right: The camera zooms menacingly in on Raglan’s leveled gun at the end of Chapter Ten. New Adventures’ primitive production conditions and its script rewrites obviously hampered its actors, who frequently come off as rather stiff and tentative in dialogue scenes; however, the principal cast members still turn in respectable performances. Herman Brix, of course, is the best of the principals; he’s outstanding when it comes to the physical aspects of his role (as mentioned above), and is also good when it comes to acting. 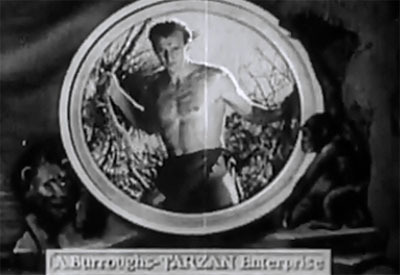 Burroughs is supposed to have personally picked Brix for the Tarzan role, considering him an ideal choice to portray the original book version of the character; if so, the author made a good call indeed. 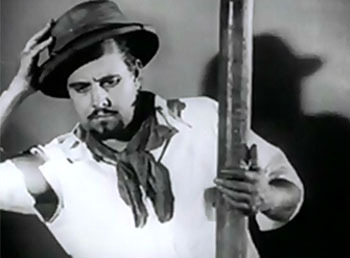 Though Brix’s line delivery is occasionally more awkward than in his other chapterplays, he still lends his characteristic air of thoughtful alertness, quiet affability, keen intelligence, and understated authoritativeness to his part–effectively capturing the cultivated and articulate Lord Greystroke aspect of Tarzan along with the character’s ape-man side. Above left: Herman Brix’s Tarzan, fresh from a lion fight. Above right: Herman Brix’s Tarzan in English-peer guise, bound for Guatemala. Ula Holt (real name Florence Watson), a semi-professional swimmer who was romantically involved with (and eventually married) producer Ashton Dearholt, isn’t bad at all as New Adventures’ leading lady, though her lack of acting experience and her personal connection to Dearholt might lead one to expect otherwise. Not the most photogenic of serial heroines, she’s still reasonably attractive, has a pleasantly calm and good-natured manner, and also does a good job of conveying grim determination as her character fearlessly tracks Raglan and the Green Goddess. As Raglan, Dearholt himself scowls sinisterly and stalks around confidently, filling the villain slot quite capably; however, he interacts with the other characters on a very infrequent basis–encountering the heroes mostly during action scenes, and receiving few chances to sneer at them or hoodwink them. He also gets almost no opportunities to outline schemes or snarl at henchmen; thus deprived of the type of brains-heavy scenes in which he could really have made a villainous impression, he comes off as a functional but decidedly bland menace. Dearholt, in his acting capacity, is billed as “Don Castello”–which, contrary to persistent rumor, was not the name of an ailing actor replaced at the last minute by Dearholt, but a stage name that Dearholt had planned to use from the start; Ed Hulse and Bill Stedman have both debunked this myth elsewhere, but it can’t hurt to debunk it again. Above left: Ula Holt. Above right: Ashton Dearholt. Australian-born actor Frank Baker makes archeologist Professor Martling seem intelligent, self-assured, and gravely dignified–so dignified, in fact, that he appears very aloof at times, particularly when he’s coolly and bemusedly reacting to the bumbling of his talkative “flunky” George (the two characters’ relationship recalls that of Professor Hargreaves and Willie Dodge in the 1933 serial Perils of Pauline–probably not coincidentally, since both chapterplays were co-scripted by Basil Dickey). Baker does show a degree of paternal warmth in interactions with his character’s daughter and her fiancé, and does a good job of registering controlled but fervent concern when his daughter or his friends are in danger. 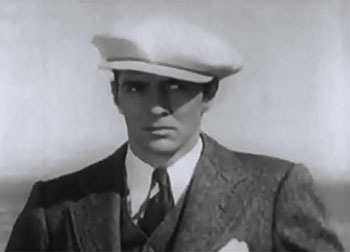 As George, former child actor and silent-era comedian Lewis Sargent is assigned some pretty weak “comic” dialogue and unfunny bits of business–constantly whining about his desire for food, getting bitten in the rear by a turtle, and so forth–but is too low-key to be really obnoxious, instead coming off as only mildly annoying (he does get to be genuinely resourceful and helpful in Chapter Two, but his character goes rapidly downhill thereafter). 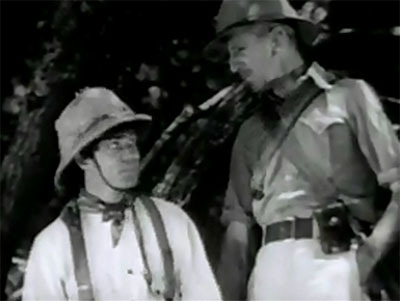 Above: Lewis Sargent (left) and Frank Baker. 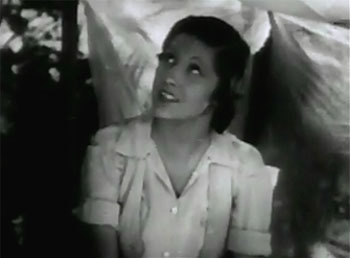 Pretty Dale Walsh and the energetic Harry Ernest are quite likable as Alice Martling and her fiancé Gordon Hamilton (the two players, interestingly, would later marry in real life), both of them conveying an appealing air of youthful enthusiasm and jauntiness; however, they drop out of the serial after Chapter Four, only reappearing briefly in the concluding episode (as mentioned, the original script would have given them much more to do). 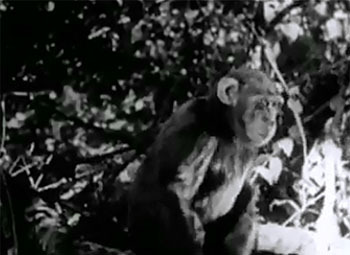 A largish chimpanzee named Jiggs plays Tarzan’s sidekick N’kima (a character taken directly from Burroughs’ books); he spends most of his screen time rushing through the jungle to carry messages to Tarzan, and (thankfully) rarely indulges in the supposedly “cute” antics associated with his feature-film counterpart Cheeta. Above left: Dale Walsh and Harry Ernest share a romantic moment. Above right: Jiggs displays deadpan puzzlement after being pranked by an off-camera Herman Brix. Jackie Gentry, the wife of Jiggs’ trainer Tony Gentry, appears briefly as “Queen Maya,” the ruler of the lost city–a character obviously inspired by Burroughs’ lovely but murderous Queen La of Opar; however, Mrs. Gentry bears very little physical resemblance (to put it kindly) to La, and–even though she delivers no lines in English–comes off as every bit the amateur actress she was. 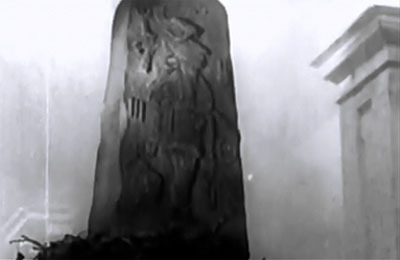 The continual references to Queen Maya’s subjects as “monsters” also provide echoes of Opar–which, in Burroughs’ books, was a lost city inhabited by beautiful women and terrifying half-simian men. 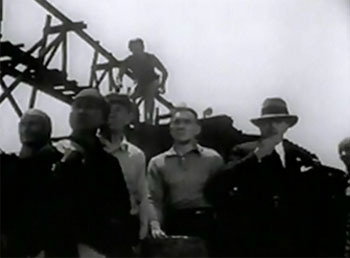 However, since the inhabitants of the serial’s lost city are played (in the first two chapters) by normal-looking Guatemalan extras and (in the later chapters) by a similarly normal-looking group of “exotic” Hollywood extras, the remarks about their monstrousness come off as rather absurd. The swarthy, white-bearded (and unidentified) actor who plays the high priest in the later episodes is commandingly sinister, however–successfully conveying bloodthirsty wrath solely by means of facial expressions, gestures, and incomprehensible “Mayan” dialogue. Shrewd and seasoned ham Earl Dwire makes the most of a small role as a philosophical expatriate scientist who’s abruptly introduced to serve as the high priest’s translator. Above left: Queen Maya (Jackie Gentry) and her followers. Above right: The white-bearded high priest harangues his picked vengeance squad. 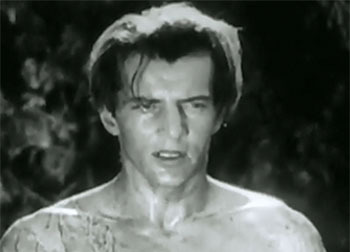 Phillipe D’Arnot, a major character from Burroughs’ first Tarzan book, is (like the high priest) played by an unidentified actor with a thick assumed French accent; even though D’Arnot plays a pivotal role in jumpstarting the serial’s plot, his portrayer has fairly little screen time. “D’Arnot’s” rather wooden delivery of his few lines would seem to suggest that he was a non-professional actor, probably a member of the production crew doing double duty as an actor. Most of the serial’s other supporting actors are also unidentified and unfamiliar–a helpful padre, various native guides and porters, a native tribe antagonized by Raglan, the thugs that assist Raglan in several of the serial’s middle chapters, and the shady lawyer who tries to talk Ula out of her search for the Green Goddess and then conspires with Raglan in the serial’s opening scene. Above left: The mysterious “D’Arnot.” Above right: The equally mysterious lawyer “Powers.” If any of my readers have a guess to these actors’ identities, I beg them to share it with me. 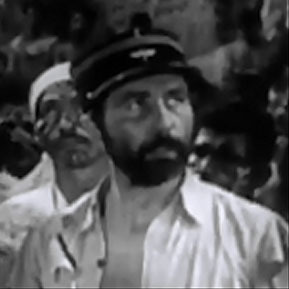 The only immediately recognizable minor players are former leading man Jack Mower and all-purpose “ethnic” character actor Merrill McCormick, both of whom play two roles. 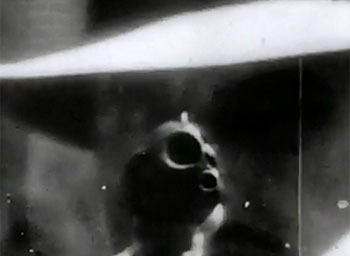 Mower pops up very briefly as an unexplained friend of Ula’s in the first episode, and takes a larger part in the serial’s climactic chapters as Captain Blade, a formidably tough and cagy associate of Raglan’s–while McCormick plays the bedraggled explorer Bouchard in Chapter One, and later returns in the smaller role of a Guatemalan who shadows Raglan on the good guys’ behalf. 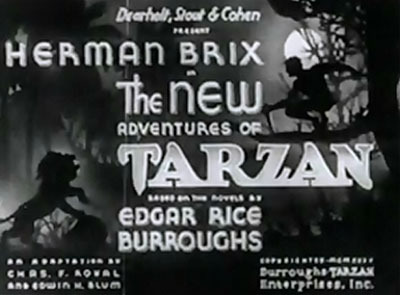 Edgar Rice Burroughs’ close connection with The New Adventures of Tarzan, and its resultant faithfulness to the spirit of the original Tarzan books, has often overinflated the serial’s reputation among chapterplay fans and devotees of Burroughs’ novels; it’s even been favorably compared to MGM’s Tarzan features–despite the fact that its production values are simply too uneven and its script too basic to put it in the same league as those films, unfaithful to Burroughs though they were. However, when judged against the other independent serials of the 1930s and not against the Tarzan A-films, New Adventures comes off very well indeed; thanks to its Guatemalan locations, its unpolished but vigorous action scenes, and the superb physical prowess of Herman Brix, it retains an authentically exotic and primitively robust atmosphere that keeps it from ever feeling as cheap or tedious as most of its independent-chapterplay contemporaries. It’s well worth a viewing for any serial buff, despite numerous rough edges. Acknowledgements: My heartfelt thanks to serial scholars Rich Wannen and Ed Hulse, both of whom have written thoroughly and well on the troubled but fascinating production history of this chapterplay. Ed’s New Adventures of Tarzan article in his magazine Blood ‘n’ Thunder (issue #5, Summer 2003, later reprinted in his compilation book Cliffhanger Classics) and Rich’s exhaustive collection of New Adventures material at the Edgar Rice Burroughs website are highly recommended for anyone interested in further information on the serial. Comments from Ed and Rich on this thread (beginning with post #18) at the Classic Horror Film Board Forum were also of great help to me in the preparation of this review; Scott Tracy Griffin’s interview with Brix/Bennett (“Bruce Bennet: The Burroughs Tarzan”) from the April/May 2003 issue (#96) of Filmfax magazine provided me with information as well. 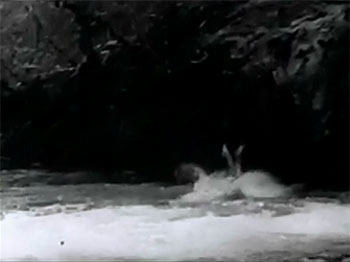 A Note on Prints, and on Feature Versions: Most extant copies of The New Adventures of Tarzan are missing about fifteen minutes’ worth of Chapter One footage–most of it consisting of the exciting waterfall plunge/river rescue sequence that’s partially reprised during the Chapter Twelve flashback sequence. 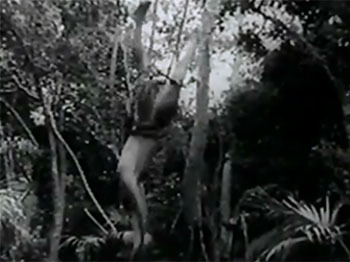 The scene can be seen in full in the New Adventures of Tarzan feature (which also contains a bit of concluding footage not found in the serial); New Adventures’ later chapters, incidentally, wound up being edited into a second feature called Tarzan and the Green Goddess, which consisted entirely of serial footage. This entry was tagged Herman Brix, Tarzan. Bookmark the permalink. Despite its many technical problems which are disclaimed in the opening credits, NEW ADVENTURE comes out pretty well. Brix [later renamed Bruce Bennett], does a credible job in both the acting and stunts department. Not mentioned here are the many discomforts he suffered during the filming. The condensed versions are good also. Worth a view. *** out of ***** for both the serial and feature versions. *** out of ***** Right on review. A crude but vigorous serial with a strong Tarzan in Herman Brix. Plenty of flaws, but a fun watch. I know I will get fierce criticism for this, but I prefer the Weissmuller ape-man Tarzan to the Burroughs Lord Greystroke version. Just has a charm for me that is missing once the jungle lord is civilized and articulate. Regardless, Brix is certainly great casting in this one. No fierce criticism from me; I also find Weissmuller’s uncivilized MGM Tarzan the most entertaining screen version of the character, even though it has little in common with Burroughs’ Tarzan. Brix, interestingly, was originally the front-runner to star in the MGM series until he was sidelined by a serious injury; one wonders if his more cerebral manner would have led MGM to gradually make his Tarzan more sophisticated over the course of the MGM films. Of course, if he’d played the part in A-films, he’d probably have been so firmly typed that he’d never have won his second career as dramatic actor Bruce Bennett. Coincidentally, while putting the finishing touches to this review the other day, I caught the tail end of the 1950 MGM police-procedural/film-noir Mystery Street on TCM–a picture that stars Ricardo Montalban as a Boston homicide cop and prominently features our man Brix/Bennett as an avuncular Harvard forensics expert; he was just as convincing tossing off medical and criminological terms as he was when tossing around natives in New Adventures of Tarzan. Apropos of nothing having to do with this serial, Montalban does not portray a Boston cop in MYSTERY STREET. He’s a detective lieutenant in the Mass. State Police assigned to the DA’s office in an outlying county, who’s instructed to go to Boston, and specifically to Harvard University, in order to obtain forensic investigativ help from the university’s vaunted Dept. of Legal Medicine. Remember seeing this serial when I was a young boy. Always thought chapter 1 was very long. When I got a copy of this serial and chapter 1 was normal run time for a serial, I thought I had been mistaken all these years, thanks for clearing this up for me. I’ve had this serial in my collection for several years, never watched it all the way through. I did so the other day. After seeing the film in its entirety, I would best describe it as quaint. Much of the acting seems to be of the exaggerated style of a silent film and nobody here delivers anything close to a professional level performance. While the film benefits from the extensive location shooting, the story is uneven and filled with holes large enough to drive a herd of elephants through. 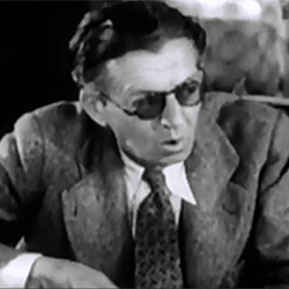 Herman Brix does look like what one would expect Tarzan to look like and it’s unfortunate that he didn’t get the role in MGM’s Tarzan the Apeman” in 1932, with a better story and more sensitive direction, Brix might very well become the definitive Tarzan. Overall, this one might best be described as a swing and a miss.